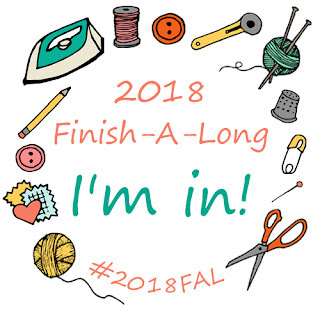 When I joined the 2018 Finish-A-Long in Quarter 2, the last of the items on my list was finishing my Boho bag, which was just a pieced flap at that time. You can see it here. I finished the bag this morning. This happens to be the 7th one I have made, I have 2 others, I made 2 for granddaughter Kyleigh and I have sold 2 as commissions. This was the front of the bag after I finished the embellishment and added the trim. The beautiful under the sea laces, trims I bought from Nicki Lee's Etsy shop Raviolee Dreams. 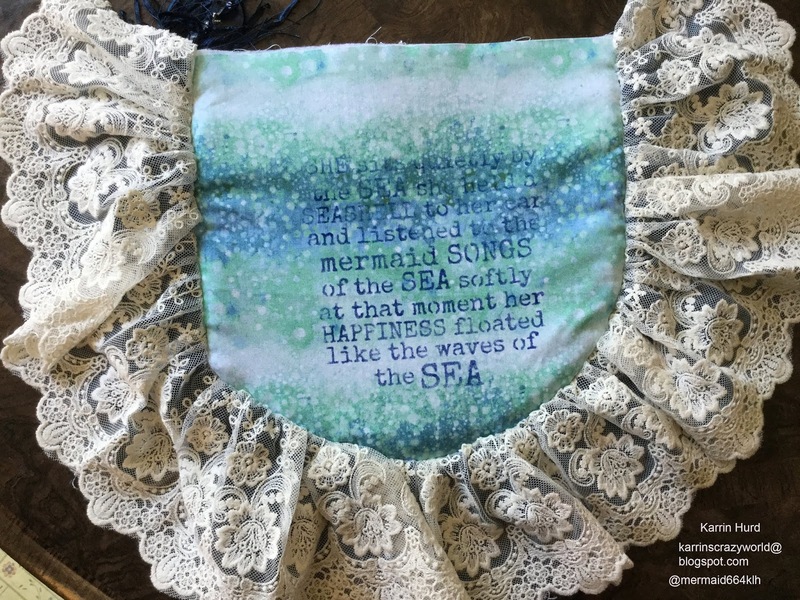 She puts together wonderful under the sea packages with laces, seaweed, shells, charms, fish, mermaids, seahorses etc. I have bought multiple from her and am always thrilled with the packages. You just tell her what you are looking for and your price range and she will make you a package up. This was the inside flap, which I stenciled. It reads "She sits quietly by the Sea. She held a seashell to her ear and listened to mermaid songs of the SEA. Softly at that moment her Happiness floated like the waves of the SEA." 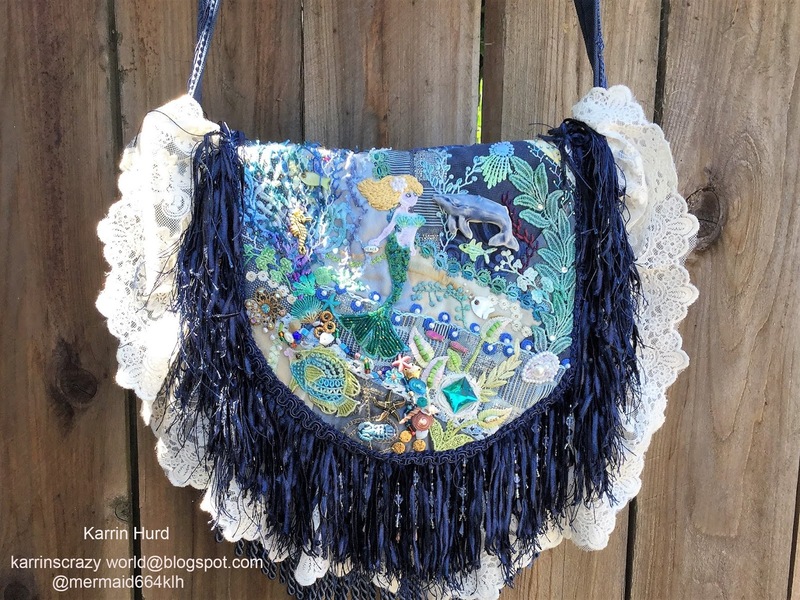 This is a vintage lace piece I sewed onto the front of the bag, under the flap as a pocket. This is another vintage lace piece I sewed to the inside as a pocket. Its hard to see but there is another pocket here for the inside with a magnetic closure, which I concealed with a flower. This was a label I put inside this morning. 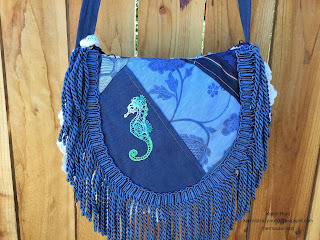 Completed back, with another of Nicki Lee's lovely dyed seahorses. Earlier in the month, I set my goal here to finish hand-quilting the center section of this Sarah Sporrer BOM called Time Began in a Garden. It looked like this when I started. It was half quilted. The binding is just folded over and sewn down. It will eventually be joined with the other pieces I have finished, with a few more left to do. I'm linking up to Elm Street Quilts-One Monthly Goal Link-Up here. Thanks so much Patty for encouragement to work on this! 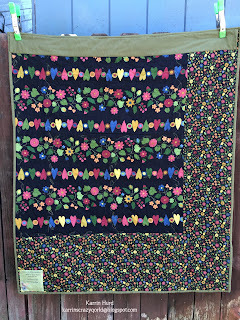 Jennifer at the Inquiring Quilter is having a giveaway of a chance to win one Island Batik Stash Builder Roll for every quilt you link up, two for every flower quilt. So I am submitting the following flower quilts I have done. 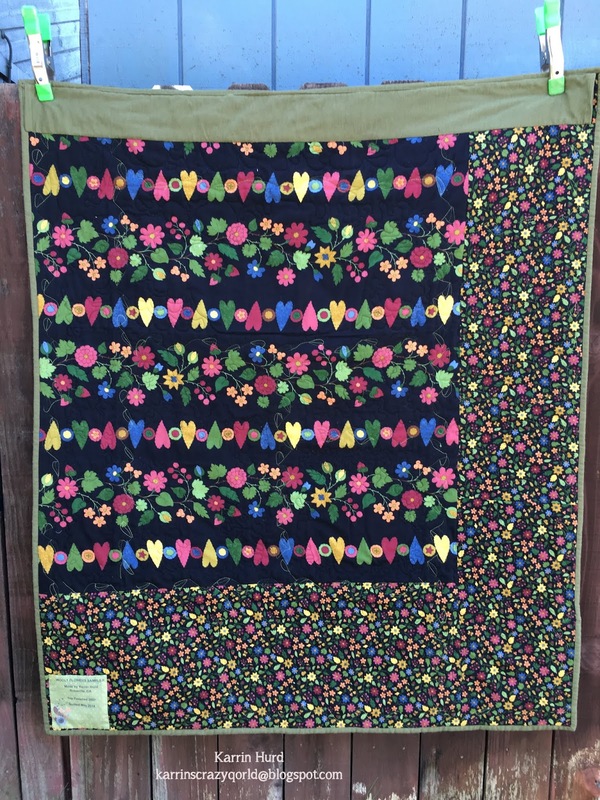 This one, Primitive Lilies a pattern by Patchwork Pieces I recently finished and gifted a 2018 high school graduate, friend of my granddaughter,. This one is part of a raw edge quilt, actually the center piece. I still have about 4 more blocks to do. It is called Time Began in a Garden by Sarah Sporrer, still a UFO. 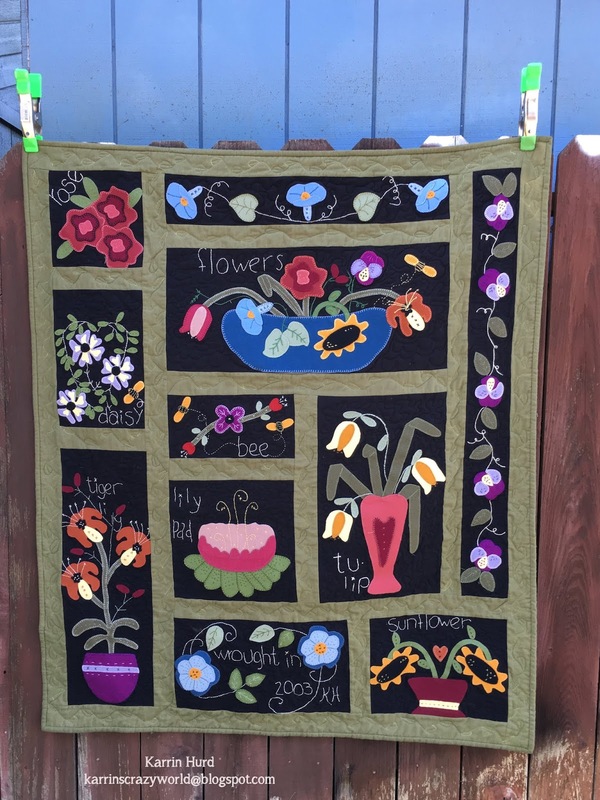 I recently finished this one, called Wooley Flower Sampler by Connie Huddleson. I had the top done, just finished quilting this UFO. I am linking these up to Wednesday Wait Loss at The Inquiring Quilter. 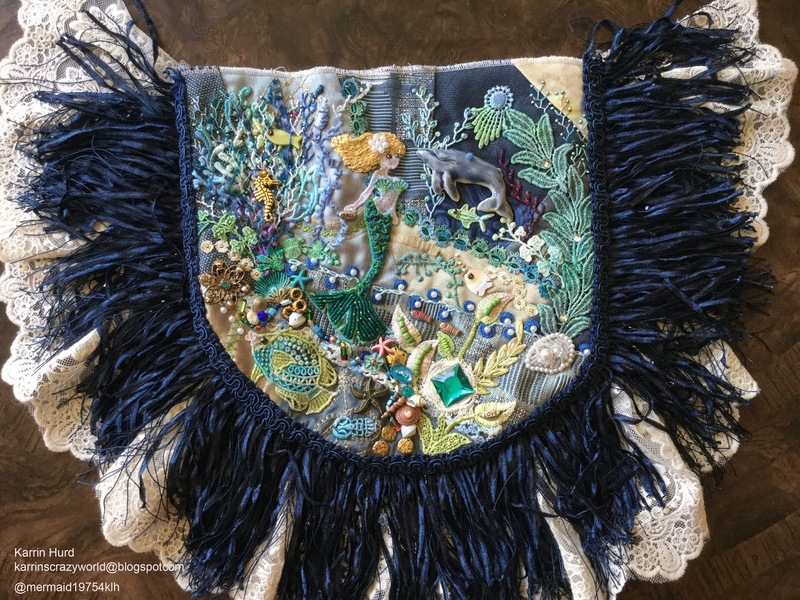 The third block for the Fall Into A QAL was released today, designed by Sherry Shish at Powered by Quilting. The pattern can be found here for the bonfire block. I'm procrastinating on working on crazy quilted my Boho purse, so I got right on this block! I decided to do a night time sky for mine. 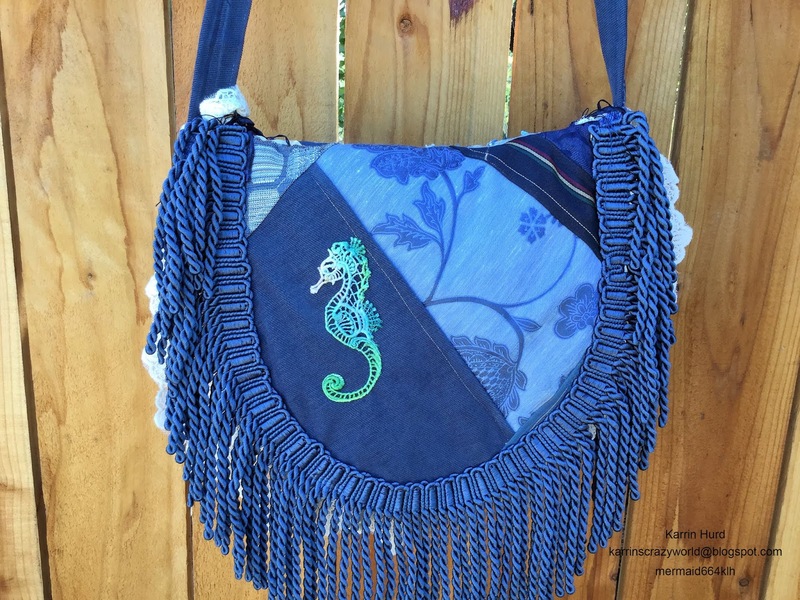 Thanks so much to Sherry for this great pattern! 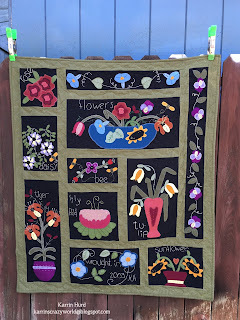 This is a Throwback Thursday post, quilts we have made before our blogging days. I am linking up with Sandra at Musings of a Menopausal Melon-mmm quilts. I can't find that I blogged about my Dear Jane Quilt. I started it in 1997, 3 years after I began quilting, and finished it in 2003. I would do rows of blocks, and then put it away for long stretches. Then I would get excited again about it and start working on it again. 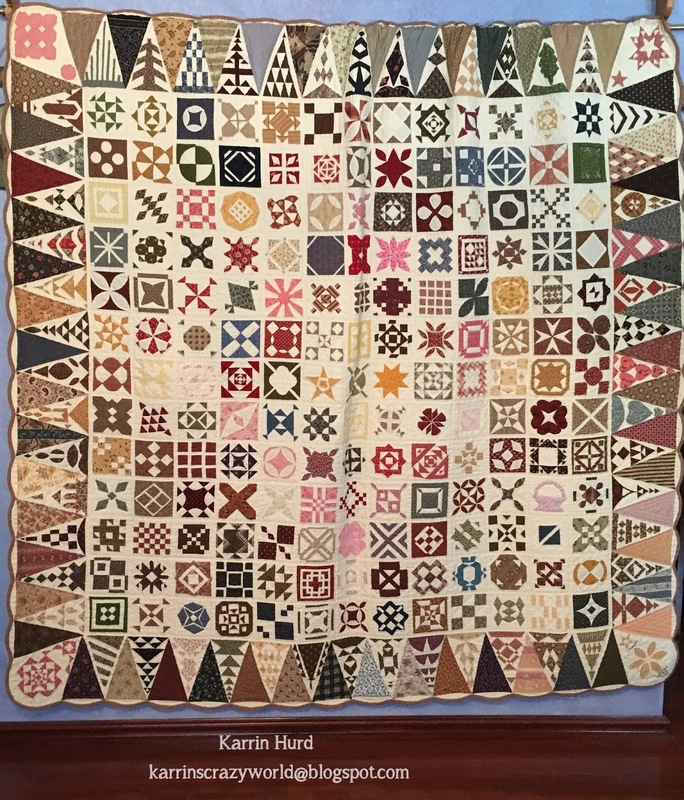 Jane Stickle was the woman who made this quilt during the Civil War, in 1863 and finished her quilt in 1868. The quilt hangs in the Bennington Museum in Bennington, Vermont. Brenda Manages Papdakis became fascinated with the quilt after she saw the quilt in the "Book Plain and Fancy: Vermont's People and Their Quilts as a Reflection of America" by Deanna Bister and Richard Cleaveland. 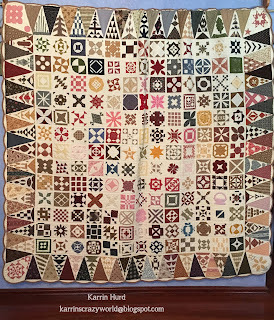 Brenda began drafting the blocks from the photos in Plain and Fancy and ended up writing the book "Dear Jane, the Two Hundred, Twenty-Five patterns from the 1863 Jane A. Stickle Quilt"
I'll be linking up with MMM Quilts. I finished up another UFO, this one dating back to 2007 when I finished the top. I wasn't sure what I was going to do to quilt it, then I closed my home-based transcription business, and went to work outside the home and didn't have much time to quilt during that period. Since I have been retired in May of 2017, I have been trying to finish up UFO's and get caught up on my grandchildren's quilts. Three of them got quilts last Fall for their birthdays (was not back into blogging at that time), and I just got Kyleigh's graduation quilt done. I have another 3 years to make one for Jaeger. So even though this was not on my Finish-A-Long list, I was anxious to get it quilted. It was a BOM, a Wooly Flowers Sampler by Starry Pines Pattern Company, designed by Connie Huddleson. This quilt was wool appliqued on flannel. It was so nice to work with. The backing is some really cute flannel too. The only thing left on my Finish-A-Long list is my crazy quilted Boho purse. I need to get going on this, I have barely started. April Adams' Harvest basket was this week's block on the Fall Into a QAL, and I love it! You can download the block here. I love baskets, and I appliqued some pumpkins and corn in mine. Thanks April for such a great block!